Welcome back! This week’s featured author is the incredible Christina Sng. Christina is a supremely accomplished author of both fiction and poetry with her work appearing in a wide variety of venues, including Mythic Delirium, Apex Magazine, Fantastic Stories of the Imagination, and many more. Her recent books include Astropoetry and A Collection of Nightmares. Recently, Christina and I discussed her inspiration as a writer, her tips for surviving the rejection of publishing, as well as how her love of gardening figures into her work. For as long as I can remember, I’ve always been scribbling a poem or doodling a comic wherever I am. It took me decades to realize that I am happiest and most fulfilled when I write. Writing is part of who I am, it is what I do as much as living and breathing is. Enid Blyton introduced me to magical worlds as a child, Robert R. McCammon showed me the horrors of humanity as a teenager, Sylvia Plath spoke to me as a young adult, and Ben Bova took me to the stars as a new mother. You are a widely published and extremely accomplished poet, with your work appearing in countless venues, both printed and online. Do you have a certain approach when crafting a new work, or is the process behind each piece entirely unique? As with everything else in life, I’ve had to make time for writing, even in the days when I had much less commitments. These days I steal time whenever I can and have learnt to write in the oddest places and even through interruptions. But only haiku survives such conditions. Longer poems and fiction require uninterrupted, relaxed, and focused time which is as rare as an automatically folded shirt. There is always a space carved out for writing and when I am in that sacred space, inspiration hits at all angles, and the story or poem flows. Often the words write themselves, almost like automatic writing but it is in the editing process, perhaps, where I am more present. Few pass the muster without being edited. But a rare few have, like “After the War”. I have a great fondness for their perfect completeness. As an author who has been involved in the publishing industry for well over a decade, do you have any tips for writers who are just starting out? In particular, how have you learned to deal with rejection, and how do you manage your time as a writer? Keep writing and submitting. Always be scrupulously polite and respectful in correspondence. When a piece returns rejected, send it out again right away but first consider any advice an editor offers. I normally give the poems or story a once over before sending it out again, within 24 hours. Many moons ago, I received a rejection from the Harvard Review on a poem where the editor had made some suggestions and asked me to resend it after I had made revisions. I worked furiously to improve it as the editor suggested. It was out in the mail (yes, the snail mail era) again within 2 weeks but during that time, a new editor took over and rejected my poem. While the rejection was disappointing, I was buoyed that a Harvard Review editor thought enough of my poem to offer suggestions on improving it. Since then, I’ve taken rejections as an indication of where I am in my writing, if the work needs improvement, and if it is a right fit for the venue. I’ll be honest. In between caring for the family and home, I have had to steal time from sleep to restore myself and write late into the night. If Margaret Thatcher could be Prime Minister on 4 hours sleep a night, so could I. Well, I make do with 4-6 hours most nights and luxurious days are the ones where I get 7 hours. But truly, most nights, my brain is in a fog so much of my work now are very short pieces. You list gardening as one of your hobbies when you’re not writing. That being said, do you ever find your love of gardens influencing your poetry? Oh yes, definitely. I’ve written a lot about humans destroying our beloved Earth, plants taking over and eating everyone, and the irreversible changes happening to our world now. On a more positive note, trying to inhabit new planets and moons but normally not surviving. Rather bleak, I admit, but I’m seeing the self-annihilation of the human species in the next 500 years, a bit more optimistic than Stephen Hawking who cited 100 years. If forced to choose, which part of the writing process is your favorite: drafting new ideas, working on a first draft, or polishing an almost finished piece? All of it, really. The joys are different in each stage. The delight in discovery, the diligence of carving and molding, and the accomplishment of a completed piece. I have many favorites. 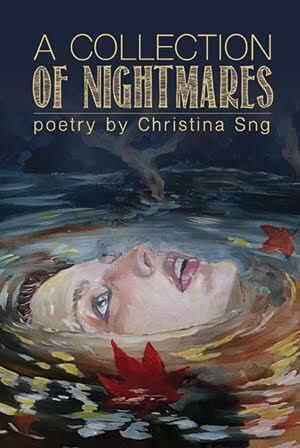 “After the War” is one of them, as is “Exquisite”, the opening poem in my book, A Collection of Nightmares. Many early poems I treasure, “The Art of Weaving” and “Postwar”. Of science fiction, “The Leviathans of Jupiter” — this year’s Rhysling nominee, “Twenty Years” — last year’s, and “The Perfect Planet”, which appeared in Apex Magazine. 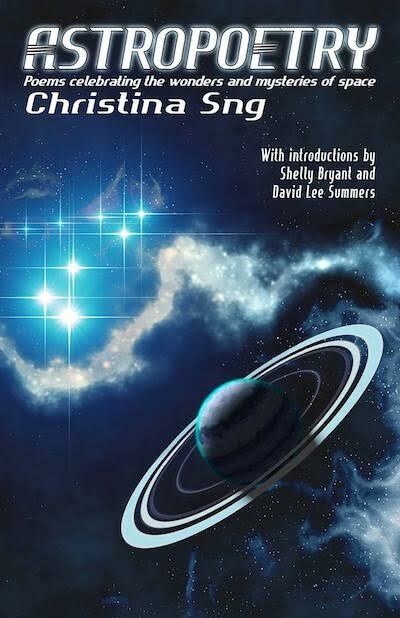 My favorite fantasy poem is “Allegra”, a 2014 Rhysling nominee. I am compiling a horrorku chapbook, a full-length haiku collection, a bumper science fiction collection, and hopefully a short story collection over the next 4-8 years. After selling a historic two flash fictions this year, I’ve been especially motivated to write more and I’m particularly enjoying writing flash and micro fiction. My various hats (fussy things they are) don’t like to be worn at the same time so I have to shift gears whenever writing a different genre. 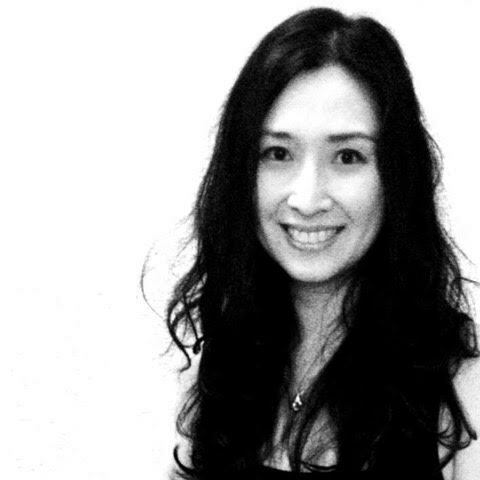 Tremendous thanks to Christina Sng for being this week’s featured author. Find her at her author website as well as on Facebook and Twitter. This entry was posted in Fiction, Interviews on December 1, 2017 by gwendolynkiste.